The curriculum in SPSAD is designed to build and focus on actual grooming of student to a dynamic professional. The Academic Calendar is based on M.D.U., Rohtak frame work. 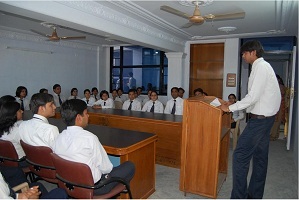 The school prepares for curriculum in advance before the commencement of a semester. All the tour visits and cultural events and quality improvement programs are prepared well in advance. The students are also given due time for library and sports to keep them physically and mentally sound. Faculty members are also promoted to take up to quality improvement programs (QIPs) in NIASA to update their knowledge regularly which is sponsored by the institute. ACADEMIC CALENDAR SPSAD maintains the Academic Calendar as prescribed by M.D.U., as the examination schedule is governed by the affiliating University. The school maintains a working semester of 18 weeks devoting one week to educational tours. The school works five days a week from 9 AM to 4 PM with a 30 minutes lunch break.